There are Saturday early nights, and then there are Saturday late nights. Different parts of the same evening call for two radically different types of music. The vast majority of the albums I’ve reviewed here, and the vast majority of the music I played on “Saturday Night Jazz” for eight and a half years, are for the early part of the evening. People want to have fun during the early part of Saturday night, and the music they want to listen to at that time reflects that desire. But later on in the evening, after the partying, the clock has struck the witching hour, lights are low and so is the music. 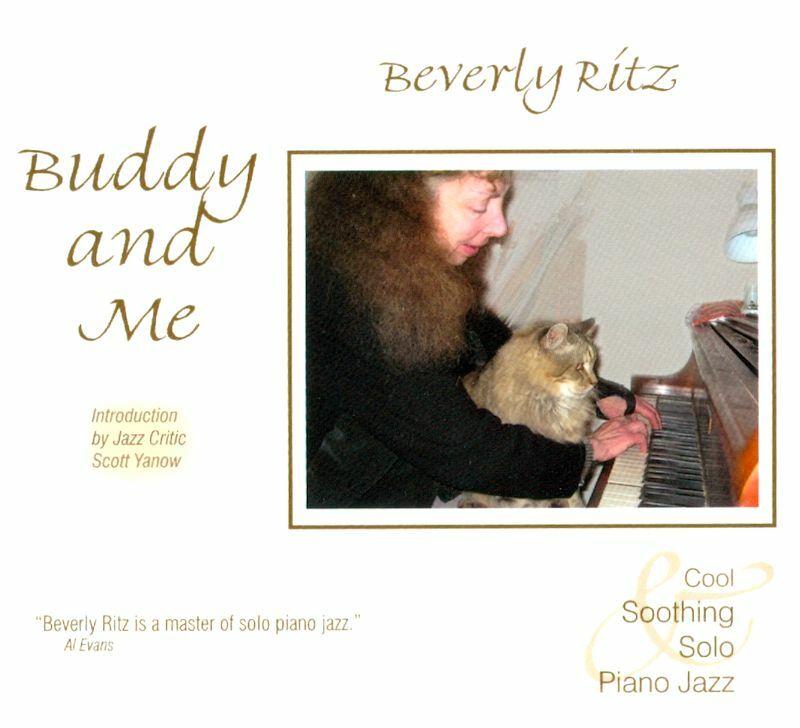 Enter Beverly Ritz, a master of solo piano jazz. In the last ten years she has released four albums, and the one I’m going to tell you about is her most recent release, “Buddy & Me”. Beverly Ritz was born in Washington, D.C. to parents who loved music. She inherited that love and began playing the piano at age three. She began formal lessons in classical piano when she was eight, then went on to play cello in her high school orchestra and taught herself to play the guitar. Eventually she returned to academia and majored in music at Santa Monica College. She has worked musically in a variety of settings, most notably at the Rowdy Creek Yacht Club in Smith River, California. A few years ago she and her menagerie of cats, dogs and what have you moved from Smith River to a small town on the Oregon Coast. The same could well be said of “Buddy & Me”, Ritz’s latest offering on her Goldie Mae Records label. “Buddy & Me” features an even dozen songs, evenly split between standards and her own compositions. The album opens with a delightful version of Harold Arlen’s classic, “Over The Rainbow”. At just under five and a half minutes, this is the longest song on the album, and while picking a favorite from this collection is a difficult task, I believe this one is mine. Ritz’s style is straightforward and eminently accessible. The next song is another classic, Paul Desmond’s “Take Five”. This was, of course, a monster hit for the Dave Brubeck Quartet when it first came out. Needless to say, Ritz’s approach does not mimic Brubeck’s bombastic keyboard attack, but rather lets the notes flow gently to and around you like a warm summer breeze, all the while maintaining the now-famous, if awkward, time signature Desmond wrote it in. We now skip ahead a few tracks to “Poor Mister Gray”, by Ritz and Tony DeCordoba. This short song has an interesting, lilting sound that is immediately appealing. Ritz’s rendition of the Richard Rodgers classic, “It Might As Well Be Spring”, is a gentle ballad, masterfully played. “If The Blues Could Remind You” is another Ritz original. This beautiful ballad is as tranquil as the flow of a creek through a forest glade. The final song is the title track, “Buddy & Me”, is a bit faster than the other songs on this album. It has a catchy melody that carries you along, happy and carefree to the end. The bottom line: I think you will find “Buddy & Me” is a wonderful addition to your late night playlist for a Saturday, or any other night! You can learn more about Beverly Ritz and her music by going to her web site. Kathy Parsons has published in informative interview with Beverly on the Mainly Piano web site. Beverly can also be found on LinkedIn and Facebook. My original content, including photos other than album covers, Copyright © 2012 – 2014 by Al Evans. All rights reserved. ADDITIONAL NOTE: This article was modified again on 11-20-2013 to replace the original “Buddy & Me” cover photo with the current cover.